These words from one of two new anthem songs on the forthcoming launch of “Keeping the Faith,” a ground-breaking double CD set, feature the unique voice of Jewish women, dedicated to helping Jews in Israel. Building upon the incredible success of its debut music & video CD project “Chazak Amenu: We Stand As One,” VOICES FOR ISRAEL is releasing “Keeping the Faith” as a continuation of its mission, to bring Jews together through music projects while assisting our brothers and sisters in Israel during these tenuous times. Over 15,000 CDs have been distributed and many thousands of dollars in net profits have been disbursed in Israel by reputable charities. The title anthem, “Keeping the Faith,” which was written and composed by Nashville musician Stacy Beyer, uses biblical imagery of Moses as a baby floating in a basket down the river to convey the idea of all Jews being saved by the collective devotion of the daughters of Israel. The video that accompanies this anthem is a stirring tribute to the representation of Jewish women both in Israel and the Diaspora. These breathtaking theme songs were co-produced by Jewish music veterans Jordan B. Gorfinkel and Sam Glaser. The double CD set includes songs by more than 40 artists such as Neshama Carlebach, Noa, Debbie Friedman and Kineret as well as popular Jewish groups like Visions and Basya Schechter & Pharaoh’s Daughter and a 100-person VOICES FOR ISRAEL choir. As we continue to make a difference in Israel, we also raise the consciousness of Jewish people everywhere with an incredible mix of contemporary Jewish music. VOICES FOR ISRAEL has been featured in Jewish newspapers and radio stations around the world. For interviews, information, or to request a CD, contact Ronnie Buchman-Schonzeit at (212) 685-5223 or visit www.VoicesForIsrael.org. 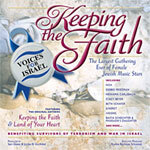 High-resolution print quality cover art can be downloaded at www.VoicesForIsrael.org/press.